Anyway, smoothies and juices are a natural on this cleanse. But, I live in Wisconsin. It’s cold here. And, as much as I love a good smoothie in the summer, the thought of drinking an icy beverage when the wind chills are below zero just isn’t as appealing as I’d like it to be. In winter in Wisconsin, I need warming drinks. 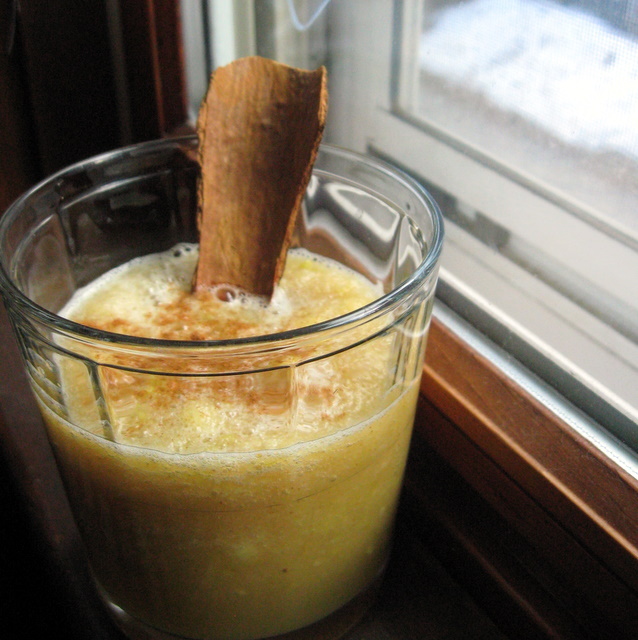 Thus was born the Hot Cider Smoothie. Not only is it warm in temperature, but it uses warming spices – fragrant cinnamon and pungent dried ginger – to get your blood flowing. Heat the cider until simmering. Place all ingredients in a blender and blend until nearly smooth. (If you have a high powered blender like a Vitamix, you can probably make this super smooth. I don’t, so I had some chunks. I don’t mind a chunky smoothie, personally.) Serve dusted with more cinnamon. This entry was posted in apples, drinks and tagged apple, detox, drinks, smoothies. Bookmark the permalink. Deanna. I love the fact that this is so simple and so warming. We were up in the mountains until Monday and it’s true, a cold smoothie did not seem quite as appealing up there in the snow. I drank hot cider every day. Maybe next time I’ll pack the blender. ;-). Thank you! What a great idea!! Will have to try the hot, spicy smoothie … yum. Wow! Thank you so much, Amanda. Another totally creative recipe Deanna! This sounds so warm – especially with the heat from the ginger. I love cider and I love putting apples in my smoothies. And guess what! My Blendtec is arriving this weekend! Can’t wait to have a proper blender! Maggie I am so jealous of your blendtec! You’ll have to let me know what you think of it and if it’s worth the money. Pingback: D-tox January, Day 5: Hot cider smooothie from The Mommy Bowl and give away. You are so clever, Deanna. I’m in Ohio and could use some warming up. I like that you not only serve your smoothie warm, but use warming spices, too. Wow – never? That’s amazing. Apple cider is so good – especially if you can get it fresh, local and unpasteurized. I buy it from an orchard in the fall an freeze it for the year. This is brilliant! Great way to start the day on a chilly morning.